Martha Stewart is a polarizing figure to say the least. Some people simply love her and her over-the-top advice. Others hate her for the very same. I always felt her insider trading jail sentence was ridiculous – all the more so now with what the Wall Street banksters are getting away with. And I’ve often thought that she was self aware and often tongue-in-cheek. But I’ve turned. I’ve joined the haters. The joke is on me after all. Why? All because of one horrifying hot dog. 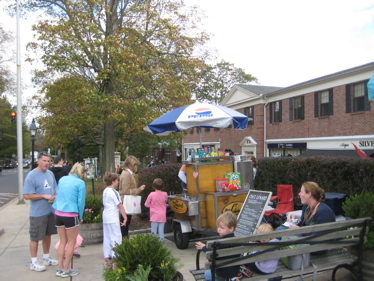 You see, Martha did a show about her favorite hot dogs and included one from the high-end cart on Ridgefield’s Main Street – the very same Chez Lenard that is also included on the Road Food “Eat Before you Die” list. I don’t know why I chose to follow her advice rather than Michael Stern’s, but I did and for that, I can no longer like her. The hot dog variation in question is “Le hot dog Epicie Garniture Suisse” which I can’t steer you clear of enough. But more on this particular dog below. 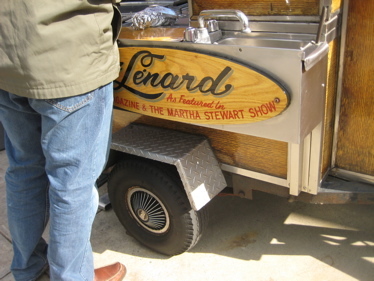 Chez Lenard is a sidewalk cart on Main Street with no address and no phone number. Nor are there any tables: just a couple of town benches, sidewalk standing-room and Ballard Park across the street where customers enjoy their lunch in the open air. Car customers pull to the curb, toot their horn, and get lunch delivered to their window without ever leaving the driver’s seat. Informal though it may be, Chez Lenard has class. 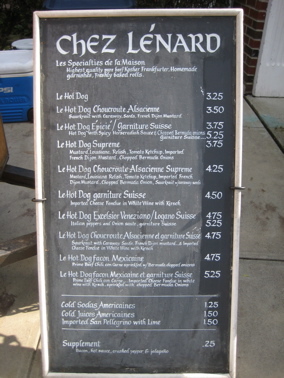 The blackboard menu lists such epicurean delights as “Le Hot Dog Choucroute Alsacienne” (with sauerkraut and mustard), “Le Hot Dog Excelsior Veneziano” (with Italian peppers and sauteed onions), and “Le Hot Dog Façon Mexicaine (a chili dog). White wine and Kirsch are made into molten fondue for the “Logano Suisse” dog. The wieners themselves are tres bons! They are slim, all-beef franks with a natural casing and muscular insides, lengthy enough to stick out from both ends of the regulation-length bun, and substantial enough that a pair of Supremes (with mustard, relish, ketchup, and chopped onions) with a can of Dr. Brown’s soda make an immensely satisfying meal. 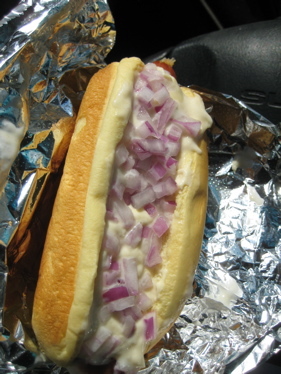 By my count, Michael Principi is the third chef at Chez Lenard, the hot dog cart that parks every day on Main Street in Ridgefield, Connecticut. A 2000 graduate of Ridgefield High, Mike brings a welcome joie de vivre to the weenie wagon and, as far as I can taste, he has done nothing to change the winning formulae that put this place a cut above. I went for the Hot Dog Supreme, which includes mustard (your choice: hot or regular), Louisiana relish (spicy or regular), Dijon mustard, chopped onion and — pace, fellow Chicago red hot lovers — a line of tomato ketchup. Ah yes, the Garniture Suisse. Spicy Horshradish Sauce with Imported Cheese Fondue in White Wine and Kirsch. Martha Stewart loves it and the book just mentioned does too (though you know they are just going by what they heard from Martha). Chez Lenard is easy enough to find – right in downtown Ridgefield across from the CVS on Main Street. The proprietor is an overly happy chap in chef’s hat with an ever-present smile. The menu itself is fascinating and certainly unique. It certainly all sounds delicious! So I took the $5.25 plunge and got a hot dog Epicie Garniture Suisse. The guy was effusive about its wonderfulness – even throwing in the “It’s Martha Stewart’s favorite hot dog!” when in fact, if you watch the whole video of her hot dog segment, that’s not technically true. But it is ONE of her favorites and she even mentioned how she still makes the effort to get over to Ridgefield from her joint in Westchester to get one every now and then. I took my quarry back to the car where my family was patiently waiting. Waiting while their father and husband, who had just driven 10 miles out of his way in order to get a stupid street vendor hot dog for the purposes of this list, secured a fondue laden hot dog for the price of 10. I was pretty excited about this one, I must admit. 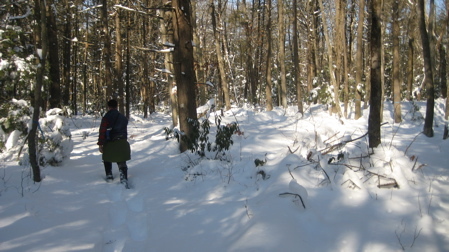 Then I took a bite. It’s gross. Remember back in the 80’s when Oscar Mayer came out with those hot dogs with a pocket of yellow cheese throughout the center tube of each wiener? And how the commercials made them look so, SO delicious! I remember forcing my mom to get them once and being crushed because they were so dang awful. 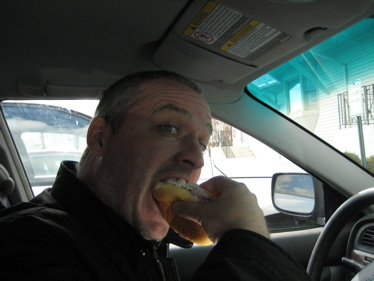 Flash-forward 25 years and there I was, sitting in the car in a parking lot in Ridgefield eating a cheese covered hot dog and immediately feeling nauseous. It was disgusting. The hot dog itself was certainly nothing special either; just a boiled hot dog of some sort. But the “garniture suisse;” a fondue with a couple weird alcohols infused within was positively awful. 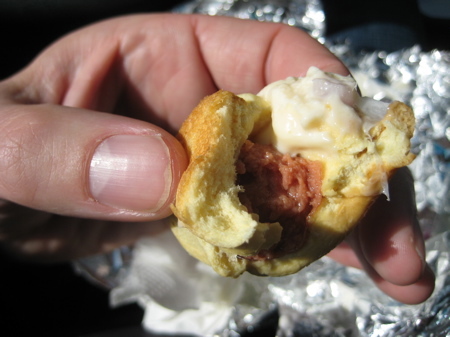 I think it may be the worst thing I’ve eaten for this “Roadfood” list of things to eat before “it’s too late.” I was bummed out that I didn’t get a “normal” hot dog and had to suffer through this disaster or eat nothing at all. 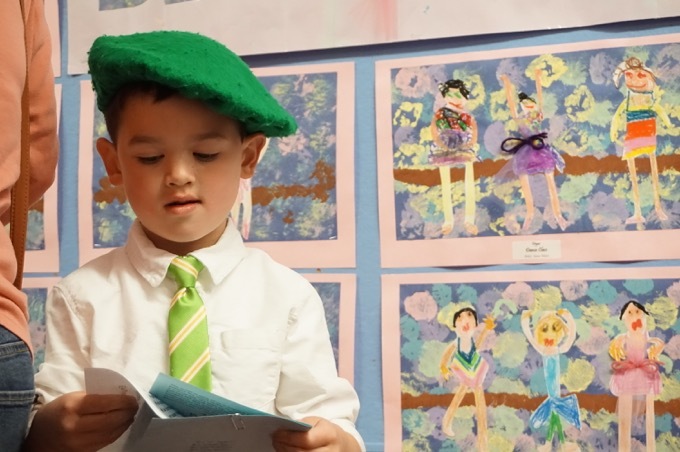 Again, I’m sure Chez Lenard’s other offerings – even the creative ones – are good. But fondue hot dogs? Take from someone who has actually eaten one: Awful. never mind, I see you did!! White wine and kirsch are not ” weird alcohols”, but rather essential ingredients of cheese fondue. Whether cheese fondue belongs on a hot dog is another matter, but now I will have to try it next time we have leftover fondue (which will be soon, as we eat it almost monthly, more often when my kids were still at home).